There is an information panel at the front of the bus, indicating the name of the tour route being travelled. Our vehicles have two internal staircases that connect both decks, and for your safety should only be used when the bus is parked at one of its stops. Also, in order to make best use of the time available, passengers should use the front staircase to go up and the back staircase to go down. Madrid City Tour offers free Wi-Fi in its vehicles so that you can go online while travelling with us. All of our tour buses are adapted for people with reduced mobility and are equipped with an access ramp at the back door and have a space reserved for wheelchairs inside. Each vehicle has an especially adapted space to accommodate a wheelchair. 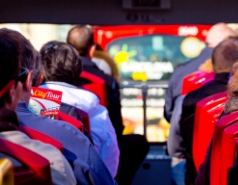 A member of our staff always travels on board the Madrid City Tour buses and can answer all your questions. All our buses feature a free Wi-Fi Internet connection, allowing you to go online as you travel with us. In the case of rain, our staff will cover the upper deck so you can continue to enjoy the route, even when the weather turns nasty. Our pre-recorded audio guide system, available in 14 languages, will provide you with information on the points of interests along our routes and at their stops. Just plug in the headphones and choose your language! 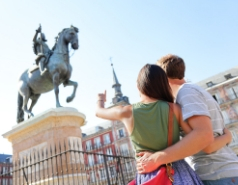 Madrid City Tour is the best way of getting to know the city’s most fascinating sights. 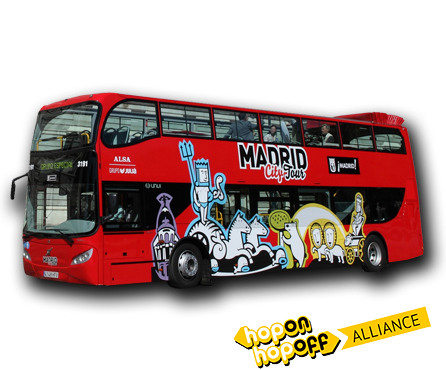 We have designed two Hop-On Hop-Off routes that cover the most important points of interest of the city: Route 1: Historical Madrid and Route 2: Modern Madrid. Both routes offer the option of an extended trip to reach monuments that are farther from the centre, as well as a night route so that you can enjoy the city lit up at night. Using our audio system, provided in 14 languages (Spanish, English, French, German, Italian, Portuguese, Chinese, Russian, Japanese, Dutch, Arabic, Catalan, Basque and Galician), you can choose your language and follow the audio comfortably throughout our tour. Thank you in advance for choosing Madrid City Tour. Together, let’s enjoy this different, convenient way of discovering Madrid! 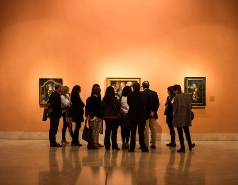 Discover Madrid with your own custom itinerary. The Madrid City Tour Hop-On Hop-Off service offers you a host of different ways to travel around the city at your pace and in a convenient way. Our tour buses give you the chance to create your own tour of Madrid by bus. Get on and off our buses as often as you like for as long as your ticket is valid and explore all the tourist attractions you wish during your visit to Madrid. At Madrid City Tour we have designed two Hop-On Hop-Off routes that cover the most important points of interest of the city: Route 1: Historical Madrid and Route 2: Modern Madrid. Both routes offer the option of an extended trip to reach monuments that are farther from the centre, as well as a night route so that you can enjoy the city lit up at night. 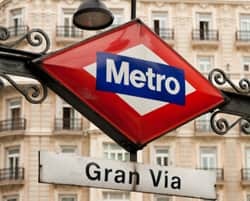 You can also make a complete tour of Madrid, passing the most important places in the city, with the flexibility of being able to get off and back on again at any of the 52 stops that Madrid City Tour offers. Our pre-recorded audio guide system, available in 14 languages, will provide you with information on the points of interests along our routes and at their stops. Just plug in the headphones and choose your language: Spanish, English, French, German, Italian, Portuguese, Chinese, Russian, Japanese, Dutch, Arabic, Catalan, Basque and Galician. It also features two special channels, in Spanish or English, for kids. 01/03 - 31/10. From 09:00 to 22:00 every 8 - 9 minutes. 01/11 - 28/02. From 10:00 to 18:00 every 14 -15 minutes. 01/03 - 31/10. Bus at 10:05 and 18:05. 01/11 - 28/02. Bus at 10:10 and 14:30. 01/03 - 31/10. Bus at 12:15 and 16:05. 01/11 - 28/02. Bus at 12:00 and 16:30. 16/06 - 15/09. Two night tours from 22:00 hour.